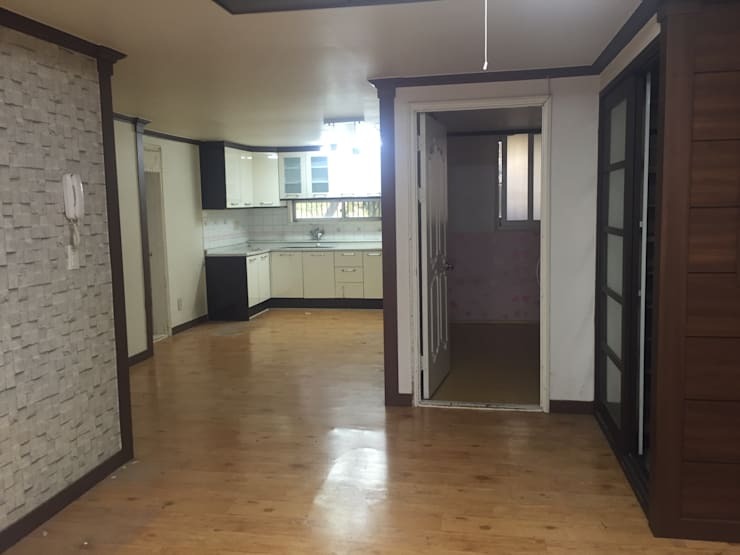 Our feature today takes us to a beautiful home in Green Park, South Korea. This home didn't always look so fabulous, but through the hard work and dedication from the fantastic interior architecture team at Design Seven, this old apartment received a vibrant new lease on life! This apartment facelift tackled the entire interior, creating and updating the modern marvel! The restoration project made a plan to include simple additions and restorations which paved the way to creating a brand new experience for the home owner. Let's have a look at this exciting project that may just inspire you to do your own home upgrade! Our first glimpse at this old and dreary apartment is that it looks neglected, shabby, worn-out and tired. While there is a wooden floor to provide some saving grace, it is definitely not the most attractive living space around, but with a little imagination, fantastic lighting and a coat of paint, the results can be quite desirable! The kitchen looks cramped and dark, while everything seems a bad choice of an off-white colour, definitely not something you would purposefully include in your home! Let's see the magical revamped look! This kitchen revamp has seen some exciting improvements! It now looks less back alley and more upmarket and chic! The greatest and most visible improvement must be the hanging lights, this fantastic addition provides instant brightness and a vibrant atmosphere to the interior! The old and boring wooden flooring has been upgraded with new wooden-feel tiles, making this interior seem instantly fresh. The kitchen cabinets were replaced with a modern black and white effect, while the walls are all-white, creating an open and airy feeling. 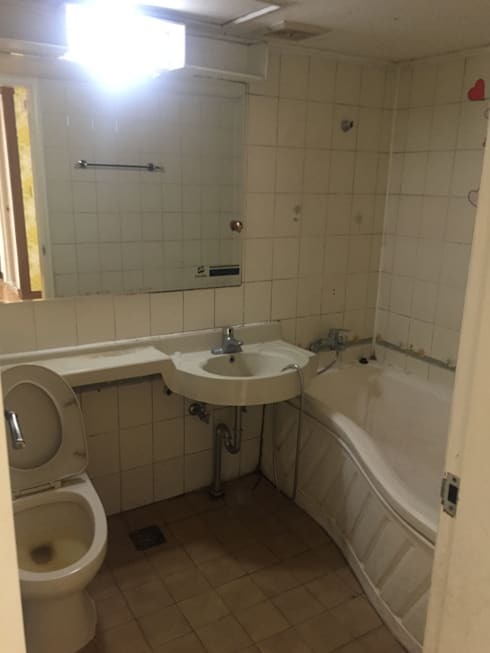 This old dingy bathroom doesn't say much in terms of elegance and classic design. 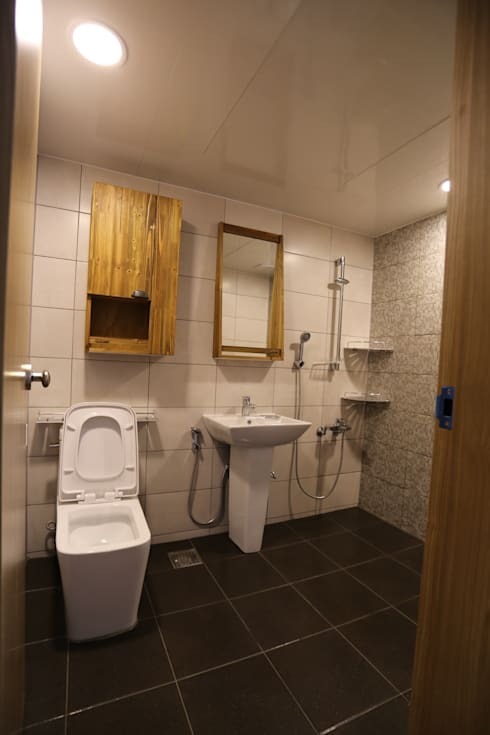 In fact, everything in this bathroom has been unplanned, from the boring and unimaginative white tiles to the lack of storage necessary in any bathroom, as well as the dreary seeming illumination. The bathroom seems even more cramped with the large bath tub, shabby mirror and unattractive lighting doing nothing to create a comfortable and relaxing atmosphere! It's definitely a waste of space, but with some out of the box thinking, creativity and simple use of colour… this bathroom can be transformed! Can you even believe that this is the same bathroom? It's so much more spacious, elegant and a pleasure to be in! The butcher-like white wall tiles have been replaced for an assortment of modern colours… charcoal for the floor, an updated white tile on the wall and even a textured mosaic for the shower! The space that is available since the removal of the bath tub is unbelievable! The bathroom now actually has space to move with a modern shower and excellent illumination adding just enough brilliance to this elegant bathroom! How about that updated mirror and storage area for your essentials? This is definitely a dream bathroom in any home! 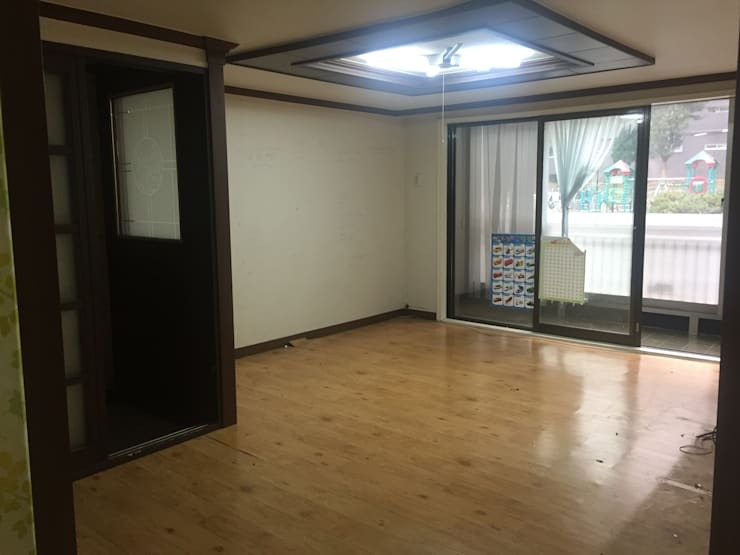 We move on now to the living room of this apartment, while the area seems spacious and has potential for greatness, the wooden flooring seems to be the only part of the living room that has been somewhat upgraded. The space seems inhibited from fresh air and the dark wooden frames do nothing to create a larger more open living space. Although the living room has a sliding door that opens onto the balcony creating an extension of the interior, this has been underutilised in adding extra comfort to the interior. But wait until you see the transformation! This living room has undergone a total transformation! 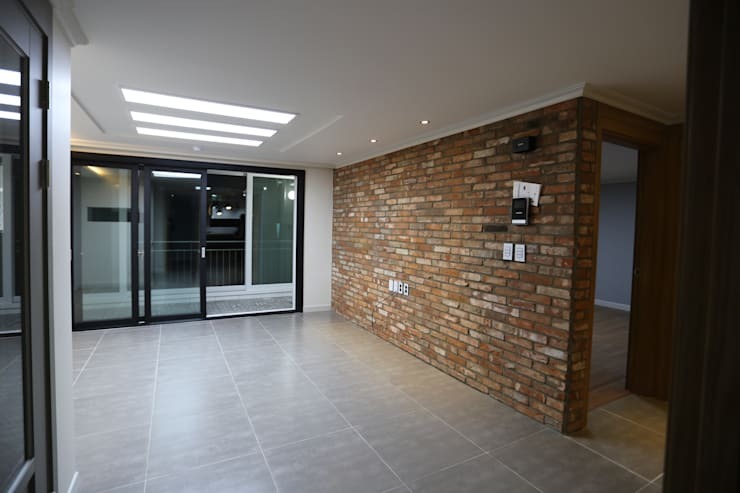 From the boring old wooden flooring to the closed off balcony, the space is now more modern, elegant with a hint of rustic charm brought in by the addition of the exposed brick wall. The colours are updated, the lighting is more comfortable and the living room of this old apartment now seems like it has a vibrant industrial influence. 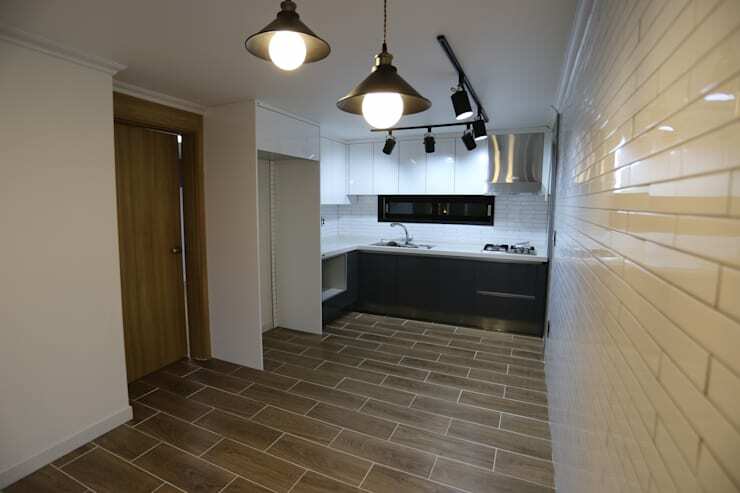 The grey tiles and excellent lighting creates an elegant interior that is no longer an eyesore. In fact, this apartment is simply admirable now! If you liked this revamp Ideabook, then be sure to check out: From Antique to Modern Delight. Have you ever had your home revamped? What was the experience like? Painful or proud?